His remarks at the army’s annual press conference comes a day after he stated at the Raisina Dialogue that talks between the Taliban in Afghanistan and the US should happen without preconditions. 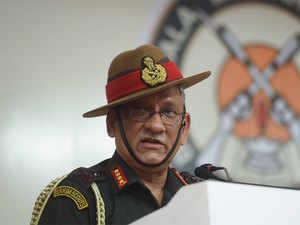 NEW DELHI: Army Chief General Bipin Rawat here on Thursday said that if several countries are talking to the Taliban and if India has interests in Afghanistan, then it “cannot be out of the bandwagon”. His remarks at the army’s annual press conference comes a day after he stated at the Raisina Dialogue that talks between the Taliban in Afghanistan and the US should happen without preconditions. He added that India has interest in Afghanistan and questioned whether India should become a party to the talks. He, however, pointed out that the same “analogy” cannot be applied to Jammu and Kashmir, where there can be no “third party intervention”. “If number of other countries are talking to this group, do we have interest in Afghanistan is the first issue. Does India have interest in Afghanistan. If the answer is yes then you cannot be out of the bandwagon...Our thinking is yes we have interest in Afghanistan and...other people are saying there should be talks, should we in some way also become a party. Maybe directly or indirectly involved,” said Rawat. “Unless you are not sitting on that table, you will not know what is being discussed,” he added. However, India maintains a policy of “no engagement with the Taliban”. Nations such as Pakistan, US and Russia have been talking with the Taliban. The official “peace and reconciliation process” in Afghanistan entails talks with the Taliban to bring them into the Afghan political mainstream. India’s support to the process was on the condition that it should be “Afghan-led and Afghan owned”. Former J&K Chief Minister Mehbooba Mufti on Wednesday took to social media to urge the Centre to initiate talks with the Hurriyat. “If the Army Chief can advocate for talks with Taliban then why different standards when it comes to our own people? Accept peace offer from Pakistan, initiate dialogue with Hurriyat and other stakeholders put an end to the vicious cycle of violence in J&K,” she posted a tweet.